After the success of their first joint meeting in May, 2008, the Great Waters Association of Vexillology and the Chesapeake Bay Flag Association met for their second joint meeting November 13-14, 2010, at historic West Virginia Independence Hall in Wheeling. During the Civil War, the building was home of the Restored Government of Virginia and the Wheeling Convention which led to the creation of the State of West Virginia. The structure was erected in 1860 as the US Customs and Courthouse and the meeting venue was the courtroom where the Virginia Ordinance of Secession was rescinded and the new Constitution of West Virginia was drafted in 1863. After a tour of the restored facility by curator Travis Henline, Bill Belanich, designer of the NAVA 44 flag who was unable to attend the meeting in Los Angeles, was presented with a 3x5 foot version of the flag. CBFA member Peter Ansoff gave a presentation entitled No Primary Reference: The Flag of the Sons of Liberty. He was followed by fellow CBFA members Dale Grimes, Jr. who spoke on World War II Navy Flags Made on Mare Island and Christopher Maddish who presented Vexillological Coincidences of the Northern Blue Seal States. In the evening, the attendees had dinner at the Metropolitan Citi Grill. GWAV and The Chesapeake Bay Flag Association. 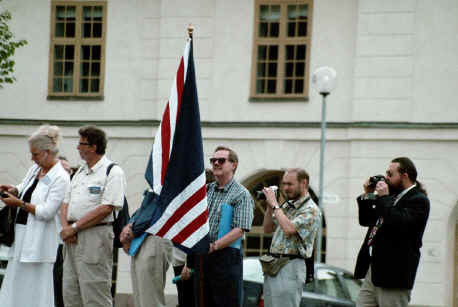 John Purcell with the GWAV flag in Stockholm, Sweden at FIAV 2003. The Great Waters Association of Vexillology was accepted as a member of the International Federation of Vexillological Associations, known by its French acronym, FIAV. President Peter Kinderman presented GWAV's application, and spoke on its behalf to the assembly. With the announcement of the vote in favor of our membership, Peter unfurled the GWAV flag as a symbol of our new status. Presentation of GWAV flag after acceptance into FIAV.